From Goodreads: Ten years have passed since Tanya Smith’s last summer at Laurel Lake – the summer of Marie. Today Tanya is a confident, successful music promoter – a far cry from the naïve seventeen-year-old who showed up at the lake full of rosy notions of first love, lifelong friendships, and evenings spent sipping strawberry wine on the shore. That September changed everything, and as far as Tanya is concerned, there’s no going back. That is, until a mysterious phone call from Marie’s lawyer brings Tanya face to face with the past. Suddenly she finds herself returning to Laurel Lake and to everything she left behind there. Will the dark secret that haunts the lake break her heart all over again? Or will Marie’s legacy be the key that unlocks the future Tanya gave up on ten long years ago? 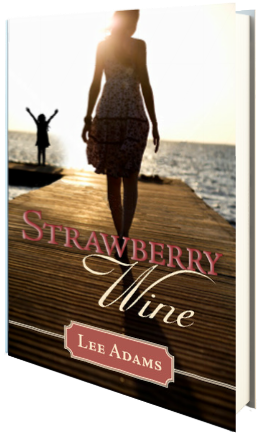 Strawberry Wine is a NA/Adult novel with a splash of YA intermixed as the story focuses on both present day and the not-so-distant past. Revolving around Tanya, a 27ish, put together, self-made music promoter, readers are instantly drawn into her life as the novel opens with the death of her estranged friend Marie, a girl Tanya only knew for one summer during her high school years, a summer that for her is impossible to forget; a summer that changed everything. Almost instantly, the novel jumps from present to past, allowing readers to live through the events of that summer as Tanya begins to fall for Michael, explore the deeper recesses of love, and become friends with Marie, the quiet girl with abusive step-relatives. What starts off cute and carefree, turns jarring and sinister as the summer progresses, and everything abruptly comes to a halt when a few drunken decisions change everything for Tanya and Marie. Here, the novel once again jumps back to the present, and it is also here that Adams sends readers a curveball, one I never saw coming, but in retrospect, should have. With the death of Marie, Tanya’s entire world is upended, altering the course of her world, should she so accept it, and in doing so, allowing her to go back to those carefree summer days and claim what she lost. It’s a beautiful tale, and I thoroughly enjoyed that present to past to present narration—it’s not back and forth, but steady, almost like a circular novel, but continuing on once it comes full circle to give readers deeper insight into current events. From carefree to brokenhearted, from on top of the world to uncertain, from safe to vulnerable, this novel spans the gamut of emotions, and they’re a very tangible aspect of the novel. Although the story itself sometimes flows a bit clipped in terms of transitions, it’s well done just the same, and as surprise and fear edge their way into the story, so does the reliance on God—though not preachy. I wouldn’t say this is a religious novel by any means, but when faced with a bad situation, as Tanya finds herself in after the death of Marie, one does tend to rely more on God. For me, this was all a bit sudden, but understandable as the plot thickens, lives are threatened, and a sinister danger lurks on the horizon. It is said that we write what we know, and Adams definitely does this in that Tanya is a music promoter, as is Lee, and a deadly kidney complication comes in to play—something Adams has also dealt with as a donor. Although fiction, Adams’ own personal experiences come through in the novel, adding validity and giving the novel extreme realism, which is an aspect I highly enjoy in my stories. Overall, this is a very well-done novel—and if you’re looking for an alluring summer read, I highly suggest adding Strawberry Wine to your reading pile. Four stars. I purchased this novel from the author at Martinsburg Chocolate Festival and Book Fair.